The Prevailing Wage (Spanish) is a general labor law poster poster by the Rhode Island Department Of Labor and Training. This is an optional poster, so while it is recommended that you post this if it is relevant to your employees, you are not required to by the Department Of Labor and Training. This poster, written in Spanish, is optional to post and describes the prevailing wage that is the lowest an employee working or state or municipal financed construction projects can be paid, when overtime rates are applied, how apprentice rates are applied, and how to file a complaint if not paid properly. It appears you don't have a PDF plugin for this browser. 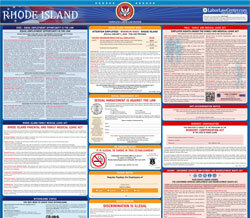 Please see the link below to download rhode-island-prevwagesp.pdf. determinación publicada con este aviso. programas de aprendizaje aprobados por el estado .